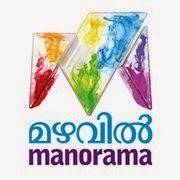 Mazhavil Manorama is a malayalam entertainment television channel from malayalamanorama group with its head quarters near Aroor, Kochi in Kearla , India. This channel was launched on 31 October 2011 at 6.30 PM. They have launched full high definition (HD) channels on 14 August 2015. The entertainment from this channel include movies, television shows, television serials, dance, music and comedy based reality shows among other programs. The channel telecast programs shot in high definition (HD) cameras enhancing viewer experience.